My first introduction to Faber-Castell fountain pens wasn’t very favourable and it resulted in this review of the Faber-Castell Basic. I sold the pen not long after the review was published. 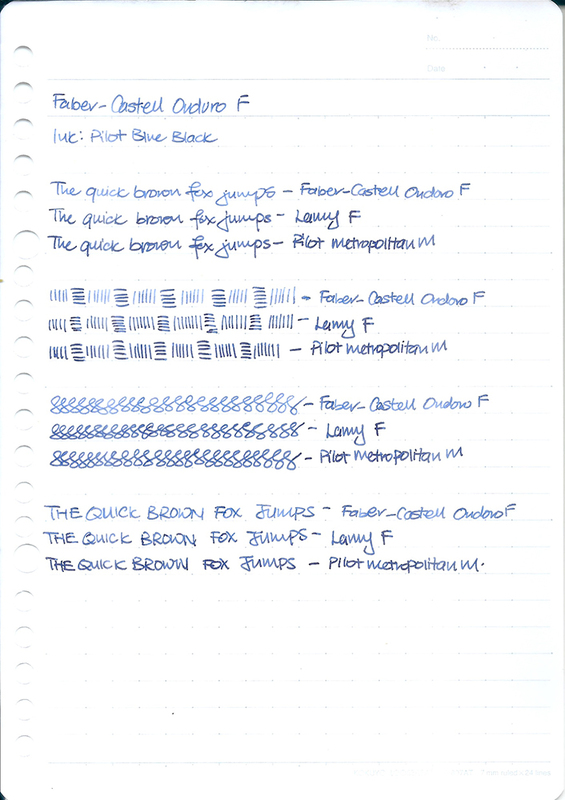 However, whenever I came across reviews of Faber-Castell fountain pens, the reviewer already made it a point to talk about the excellent stainless steel nibs they have. I began to wonder if I got a lemon Faber-Castell Basic. It was then a friend and I visited the local Faber-Castell boutique at ION Orchard. The Faber-Castell Ondoro caught my eye and it wasn’t long I was an owner of one. The Faber-Castell Ondoro comes in a compact, cardboard box. The outer cardboard sleeve sports a black and white photo of a bridge printed on it. The inner pen tray slides out easily when you pull on the brown leather like tab on the side. The pen is nestled in the middle of the tray together with an instructional manual. It is somewhat similar to Lamy’s grey cardboard packaging but where Lamy’s was functional Faber-Castell was elegant in its simplicity. I like that. The Faber-Castell Ondoro is a hexagonal shaped pen. It has a heavy metal cap with either a resin or wood barrel. 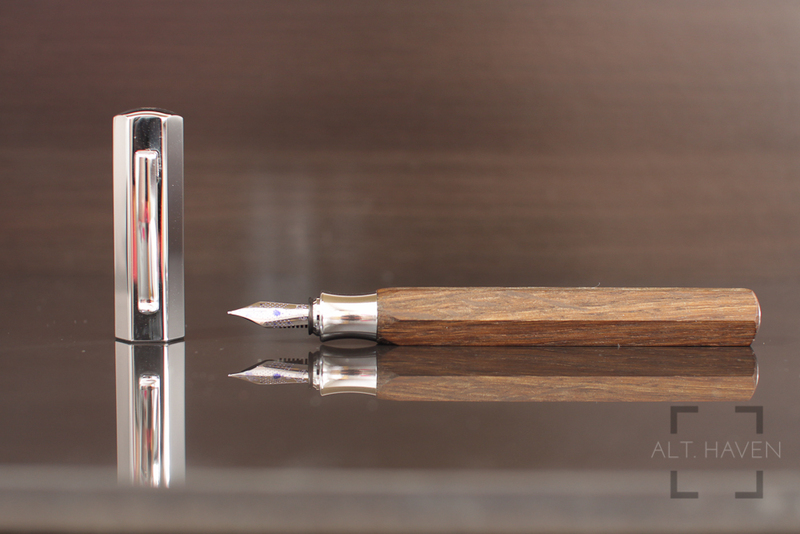 I had opted for the wood barrel given that Faber-Castell and their high-end sibling Graf von Faber-Castell are known for their in wood finishes. This is my first experience with a wood barrelled fountain pen. The wood grain is very nice against my fingers as I run my fingers along the barrel. It feel radically different from the regular resin barrels that I was familiar with. I was worried that the wood barrel would be easily stained by evidence my poor wooden writing table. I was advised to wipe off any spilled ink on it as soon as possible. Thankfully, there have been no accidents so far. The metal cap sports a spring loaded clip which slips over the covers of notebooks easily. The Faber-Castell logo is stamped into the finial of the cap but other than one logo, you will not find any other logo on the pen. The cap is slightly larger than the barrel, so the cap isn’t flushed against the barrel. The snap cap takes a very deliberate force to uncap and cap the pen, so no worries of the cap coming loose accidentally. The cap is highly polished and you could use it as a mirror if you really need to. Thus it is very much finger print prone, if you are OCD like me you’d be constantly polishing the cap. Once you uncap the pen, you will see a very short metal grip section. The grip is as polished and as finger prints prone as the cap. At first I was worried that the shortness of the grip section would be an issue. The grip is concave and it guides your fingers to the proper position. The grip might not work for you if you prefer to grip the pen higher up. Also, if you are wondering why it came with a metal grip instead of a wooden one, it is probably to prevent staining. Imagine having a stained grip but a unstained barrel. The pen is hexagonal in shape so the facets are large. The edges are not particularly sharp but they are definitely not so rounded like how a 2B pencil might be. For short writing sessions, I had no problems with either the grip or the facets. However, it’s a different story altogether once you are writing for anything more than 10 minutes at a time. The facets feels sharps the longer I write, especially where the barrel rests between my thumb and index finger. I found I couldn’t use the nib as a point of reference to decide to hold my pen. I had to make sure my fingers aligned to the facets of the barrel. That way, the nib is not really aligned to the paper, it is rolling rather significantly inwards. One thing to note, I do not grip my pens in the traditional tripod grip. My thumb would wrap itself around the front of the grip. People with a traditional grip wouldn’t have the same problems. The Faber-Castell Ondoro is a cartridge and converter fountain pen. It takes a long or short standard international cartridge and converter. It’s nice that it doesn’t have a proprietary cartridge and converter system. Mine came with a converter packaged with the pen. The Faber-Castell Ondoro is a hefty pen. It feels more front heavy probably due to the metal grip section. I like that it is front heavy as it helps to centre the pen in my hand. I use the pen unposted but the cap can be posted if that’s what you prefer. Let’s get down to business. The nib is a stainless steel F nib. It doesn’t have a breather hole and has a dotted pattern as well as the Faber-Castell logo and the nib size stamped. It writes heavenly. I am finally beginning to see why Faber-Castell stainless steel nibs deserved the praise they get! It glides across the page with only the slightest hint of feedback. Of course this is totally dependent on the paper you use. I was expecting a gusher of a nib but the nib has a very manageable flow. Remember, I was rolling the nib inwards by a significant degree but it wrote as smoothly as when I held it at the right position. I am very impressed by the nib of the Faber-Castell Ondoro. One OCD point though, my nib doesn’t align with any of the facets of the fountain pen. This might differ from pen to pen since I’ve seen photos of Ondoro where this isn’t the case. Faber-Castell pens like any other companies have their share of lemon pens. If you get a good pen, you’d be singing its praises but if you got a lemon, you’d be wondering what was the fuss about. That’s what happened to me. Faber-Castell Ondoro is a very nice fountain pen which has a few quirks. The quirks are not deal breakers for me but it might be one for you. 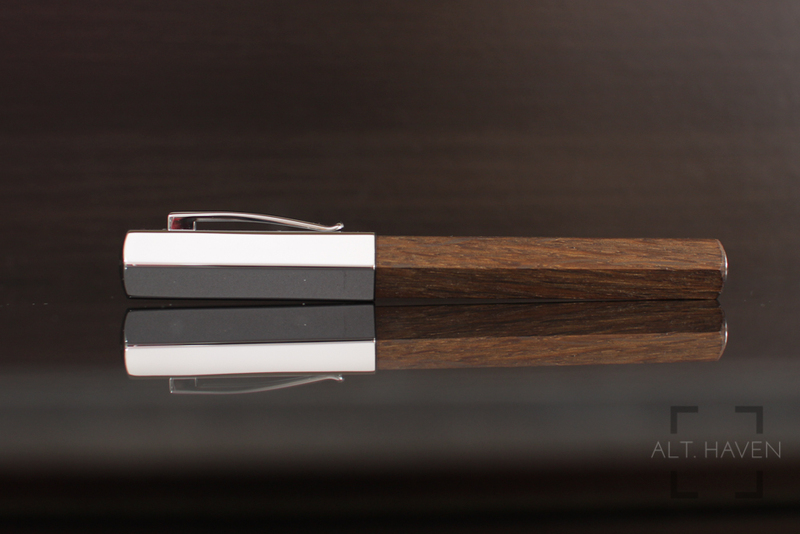 This is one pen to drop by a brick and mortar store to try out before buying.